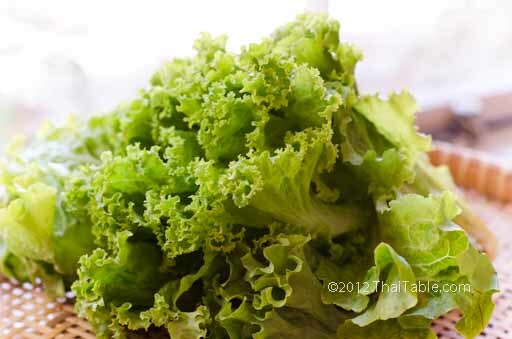 Green lettuce has light green tender leaves with ruffles on the edges and almost no stem. Green lettuce was one of the first salad greens in Thailand, thus it's dubbed 'salad vegetable' (ผักสลัด) in Thai. Now with more Western food influences in Thailand, we have other salad greens such as red and green oak leaf lettuces, iceberg lettuce and butter lettuce. We even have a good number of these salad greens grown in hydroponic farms all over Thailand. In Thai cuisine, green lettuce has been used in 3 ways: in salads, as a garnish and as an accompaniment. Leafy vegetable salad is not traditional in Thai cuisine, so a Thai “salad” is the Thai interpretation of western salad. As a garnish, lettuce often lines the bottom of a plate to add colors and beauty. As an accompaniment, you'll see it on a plate with other fresh vegetables like cucumbers or small eggplants. Some people now stir fry lettuce too.